Iowan | What a book! When I lived in England in 1998, I lived and worked in a posh little pub tucked away in the hills of the Chilterns in Buckinghamshire. There was a country gent who lived down the lane from my pub who would ask me to give his hair a trim now and then. He was a bit eccentric to let a damn Yank have a whack at his hair but I must have done an okay job because before I left to come back to the states, he gave me a book. “Notes from a Small Island” became a cherished book in my house and introduced me to the wonderfulness of Bill Bryson. ‘Notes’ chronicles an Iowan’s last, fond walkabout around the little island he had called home for almost twenty years, before he packed his family up to come back to the states. 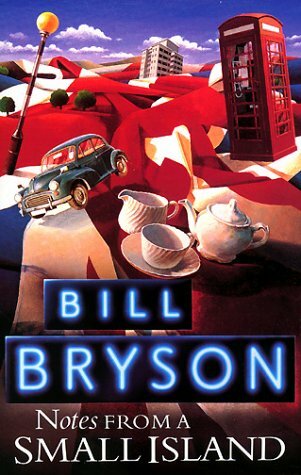 Full of amusing anecdotes and belly-laugh inducing comparisons between the British and Americans (the first few pages are devoted to the fact that the British really have no concept of distance), Bryson makes his way by train and often by foot around England, Scotland and Wales. He revisits many little towns and hamlets he had been to on his first arrival in the UK as well as all the places he had been to since, taking us with him on a grand tour of this enchanting place. I often find travel books hard to get through. I find them a bit dry and pretty much just good for telling me what time of the year is best for visiting certain places. But Bryson gives us such an intimate and thorough glimpse into the UK in this book (indeed in many of his travel-type books, he does the same thing) that you don’t feel like you’re reading a travel book at all. He has a Dave Barry-esque style to his humour and and writing that I often find myself laughing out loud when reading his books. And then I look around to make sure I’m alone because that just looks odd. I’ll write about some of his other works in the future, but I wanted to start off with ‘Notes’ because it’s very special to me. I re-read this often and still laugh every time. YOU’LL LIKE THIS IF: You love anything British and have a quirky sense of humour. Bryson’s digression on place names in England alone will have you rolling. I mean, ‘Farleigh Wallop’. Seriously.